Q: What do Lesbians bring on the second date? I was thinking 'Starbucks' for our second date, but I guess this works too. We’ve all seen it happen. Lesbians go from Lez-be-friends to Lez-be-girlfriends to OMG Lez-be-2gether 4-ever in what seems like the blink of an eye. Similar to James Dean, Lesbians live life on the edge, ignore the clear cut rules of society, and create their own. One day their toothbrush is in your bathroom and the next? their armoire in your bedroom. I enjoy a lot of the finer things in life, including but not limited to; wine, expensive cheese wheels, and asserting my independence. I enjoy the fact that my girlfriend and I have separate interests, spaces, and individual lives. 1. Lesbians are crazy. I did the math once and realized that it’s about a 70/30 ratio. For lesbians, the “urge to merge” seems to prevail over what most sensible people would refer to as logic. 2. It doesn’t seem like such a “big deal” in a female-to-female relationship to jump the gun on things like moving in. There is an undeniable bond between woman – we all manage to bleed for three to five days without dying, and take delight in cooking, cleaning, and wearing high heels while vacuuming. We are already used to being around each other. 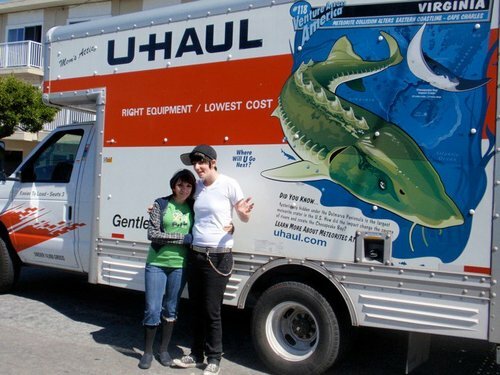 Some may read this, perhaps on their Smart Phone as they drive their packed U-Haul to their new place with their lesbian lover of two weeks and think that I am the “Scrooge McDuck” of Lesbians. The honest truth is that it doesn’t matter – gay, straight, bisexual, even my cat can make questionable choices. What is true, is that there is a stigma – one that this lesbian thinks, we perpetuate quite well. 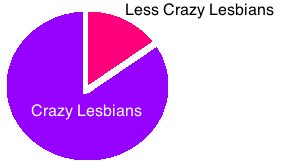 Posted in Uncategorized.Tagged crazy lesbians, gay, gay girls, glbt, hot lesbians, lesbian life, lesbians, lgbt, moving fast, queer, second date, u-haul. but if it’s a Budget truck, it’s ok. I love you Ms. Valentine!